Use this Cal-Mil 632-2 4" silver square drip tray to keep your hot beverage station neat and organized at your restaurant, buffet, or cafe! The modern, silver metal exterior will be an attractive part of your decor, while the plastic inside tray traps drips and beverage overflows to ensure a well-kept appearance for your guests. 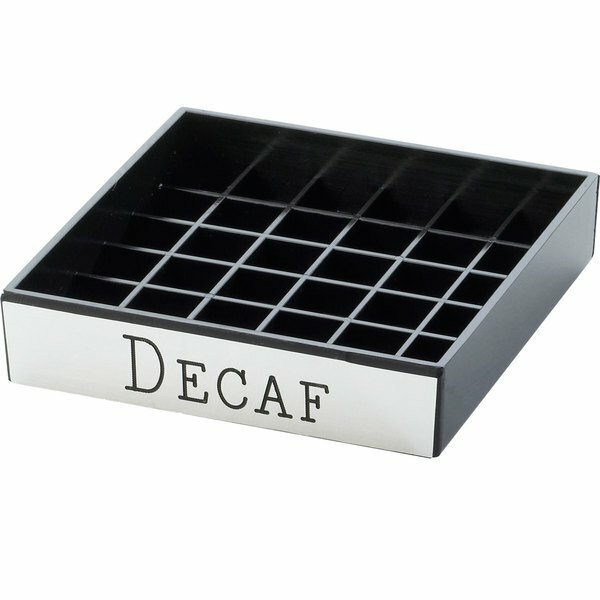 This drip tray is engraved with "Decaf," making it easy for your guests to identify the beverage of their choice while helping your staff stay organized. It features a lattice base pattern in order to keep your serving container securely in place, and it's also very easy to clean out when it fills with liquid. This product can expose you to chemicals including Acrylonitrile, which are known to the State of California to cause cancer, birth defects, or other reproductive harm. For more information, go to www.p65warnings.ca.gov. WARNING: This product can expose you to chemicals including Acrylonitrile, which are known to the State of California to cause cancer, birth defects, or other reproductive harm. For more information, go to www.p65warnings.ca.gov.